You've found the “U.S. 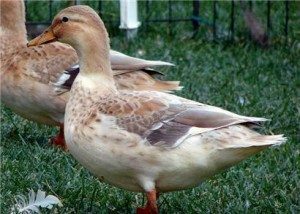 Australian Spotted Duck Breeders” page here at Hobby Farm Wisdom! If this is the first time you have visited our site: Welcome! The Australian Spotted is classified as a bantam breed with a weight averaging 2-2.2 lbs. They have a teardrop shaped body with legs right under the middle and a small head. Depending on their variety, the color of their heads can be green, blue or silver, all having a white band on their necks, their sides and breast are burgundy and their underside is white. Their wings, shoulders and tail are varying shades of gray and the tail under cushion is black. Their bill is greenish-yellow and the legs and feet are orange. Their personalities are calm and are considered hardy animals and expert foragers reducing populations of slugs, snails, beetles and other pests. They are active fliers but they usually stay close to home. They have fine textured meat but they are also the best egg layers of the bantams producing 50-125 cream, blue or green eggs yearly.